The work of Dutch poet, psychologist, and harpsichordist Hans Favery (1933-1990) has been widely acknowledged and celebrated in Holland. His first book, Poems, was published in 1968 and won the Amsterdam Poetry Prize. Unfortunately, none of his collections were translated into English during his lifetime (although New Directions published Against Forgetting: Selected Poems, translated by Francis R. Jones, in 1994). The recent appearance of Chrysanthemums, Rowers, translated by Jones and Favery’s widow, Lela Favery, and published by Leon Works in 2011, marks a very welcome addition to the poet’s English-language catalog. Although they are often hermetic and obscure, the poems Chrysanthemums, Rowers, reach out to the reader by connecting with many intermediary people. There are sections dedicated to Hercules Seghers, Sappho, and Francois Couperin, as well as one titled for a Mr. Lepinski. In many of the poems, Favery exactingly presents small doses of intensely personal experience, as if opening dozens of tiny windows into himself. Windows are meant to be looked through, and in compiling his dedications, he creates a guest list—and thereby invites the reader to peek inside his world as he constructs it. As one clipped, small, free-verse poem follows on another, the reader also begins to sense that Favery may have been in touch with some of his contemporaries in America, particularly Franz Wright and Charles Simic. The first poems in the book bear a strong resemblance to the work of these poets: they play with grammar and vocabulary in language that is terse and quiet, and they embrace the bleak mystery of the hermetic world they create: “[…] and stone kisses stone / and water drinks / water dry: / O lack— / most heartfelt” (p. 8). 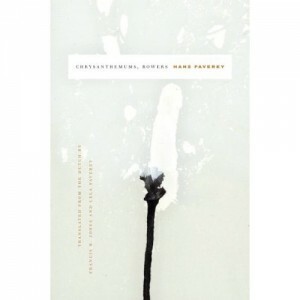 Favery is fond of using mystery as a technique to investigate the epistemology of human experience, and employs a time-release strategy in many poems that refrains from revealing the core of the poem until the final moment. As in many poems by Wright and Simic, the reader cannot know the shape of the poem until reaching the end—and so the poem becomes a puzzle the reader solves from the inside-out. This strategy allows Favery to stop time ever so briefly in his poems and open up a space for his concerns. He begins one poem sitting in a circle and ends it, “[…] almost / where I ought to be: / even if it were me / sitting on the bank, or / rather: lying on the bank, / beneath eared, white or / almond willows, hanging / so long on which have been / the harps; the strangled” (p. 11).